Let’s go through the character creation process for Zweihander and throw together an NPC or two. 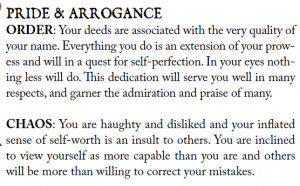 Excerpt from the book. I’ll go through these in stages. Okay, this just seems to be an overview of the process. Spend points, get prizes. While in the game world I imagine there are some other races they have been pushed to the edges of the world and the darkest depths of the forests. This is going to be somewhat closer to the real world, so while possible to have a female warrior she would have to hide the fact she was a woman during the army and likely would be widely shunned as a sell sword or other vagabonds. So Human male, for simplicities sake. The vanilla seem to be +1 to cb, ib & pb, -1 to ab, fb & wb, think I’ll need to work on that a lot. This is a d100 roll, so “Grim Resolve” may spend a fate point to ignore a melee or ranged weapon attack after suffering damage. 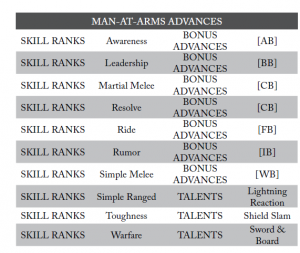 Well, I’m not rolling for this, Warrior archetype, got Man at Arms. A professional soldier. Well that willpower reduction due to the racial traits gives this chap a Peril Threshold of 5 (3+ WB) so it’s 5 (11/17/23). Damage Threshold this is BB plus your armour’s damage threshold modifier. Well, I don’t have any armour atm so that is 4. Encumbrance limit is 3+ BB so 7. Initiative is 3+PB so 7. Movement is 3+AB so 5. Season of Birth – rolled 79 which is winter. Age group – rolled 20 which is young so no distinguishin marks. Now I wonder if the character gets a modifier to the number of creation points they get due to this, because they should. Body Type – 100 – Corpulent, well it just says you’re a fatty, but given “husky” means you can be well muscled I am going to say that this doesn’t mean the chap is fat but very tall with a broad muscular build. +20% price modifier for armour and clothes. Height/Weight 6.2″ 301 lb I’ve got no idea what that kind of weight looks like… which is a general issue with these kinds of random rolls plus random weights. I’ll just ignore the number. Upbringing – 88 – Reverent, my old man was a mad priest of some sort. By default you start with 1 fate point, if you took a drawback you get 2. So we start with 2 fate points. I’ll insert the game text for that here. So you get 1000 points to spend on things from your character profession that we picked like 7 steps ago, see imo I’d give older characters probably 20% extra starting points for each bracket they were above young. So we need to spend 100 reward points to enter the first profession, with this you gain the professional trait, and an iconic trapping. 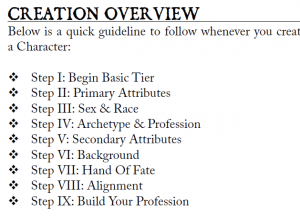 Now I’ve gotta say, that this is probably the most confusing esgment of the character creation, after reading it a few times I’m guessing you you can spend the last 900 points on the things listed in the profession however you like, and you must purchase all of those things before you move to the intermediate tier. I think that’s it. Guess we will, purchase an extra rank of BB and CB, Sword & Board, Martial Melee, Simple Melee, Awareness, Ride, Toughness & Simple Ranged. That comes to 100 points.